Local athletes who had made it to their respective County teams trekked to Nottingham for the high profile Inter-counties Championships. Liverpool Pembroke Sefton provided 9 representatives. In the Under 15 race and running for Lancashire Joe McKenna was 99th and Andrew Bowen 165th. Also for Lancashire in the Under 17`s were Rob Stocks(53), having a rare off-day, and Chris Melling(196). Best high placing for LPS was Merseysider Ben Jones(22) with team mate Michael Rimmer struggling a little at 112th. Although 60th doesn’t sound particularly noteworthy Jimmy Boardman`s performance for Merseyside, and second in their team, was one of the best of the day for the local club. After all this was among the elite in the country and included the international trials. LPS exile Sammy Rashid living in Sheffield but representing the County of his birth Warwickshire came home in 136 spot. Steve Freeman who has had an excellent season also earned a purple vest for Merseyside in 186th spot. The LPS sole female representative was Kiera Vogel running for Merseyside in the Under 20 race and collecting a creditable 39th placing. After a stunning win in the AAA Indoor Championships Phil Taylor went to Cardiff with high hopes in his first international. He will remember the experience with a rueful grin. In the 400m he adopted his tactic of being first to break after lap one but was narrowly edged out and was thereafter chasing the game. A tangle with another English runner left him pulling up dejected in third place. 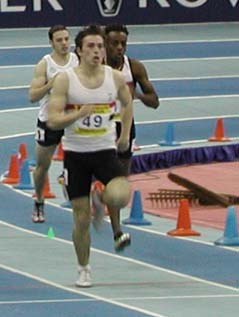 However, confidence was regained in the 4 x 200m relay when he recorded a fine 22.5 split and helped England to second behind Ireland. Over at the highly competitive English Schools Cross Country Championships in Maidstone Ben Jones made up for a slightly disappointing Inter-counties with 3rd in the Senior race. Elsewhere Kiera Vogel was 51st, Rob Stocks 81st and Erin Halsall 101. In the St Helens 5K road race Jimmy Boardman was a narrowly run out of second spot. It was a weekend of frustrating third placing for LPS. The Mid-Lancs Cross Country League is a favourite competition for Liverpool Pembroke Sefton athletes and they invariably emerge with a collection of trophies. This year was no exception with the final match being held at Townley Park, Burnley. Taking advantage of the absence of a number of athletes at the English Schools Championships two local athletes seized their chance. Steve Donegan was a comfortable winner of the Under 20 race and with superb back up from Andrew Donaldson(3) and Dave Phillips(4) the team race was assured. Undefeated they were runaway League champions. With friendly rival Rob Stocks away at Maidstone Carl Williams also sensed his opportunity in the Under 17s and raced to a comfortable victory. Again there was the traditional LPS packing of Matthew Brooks(6), Mark Leicester(7) and David Furlong(8), match winners and title in the bag. Although the Under 15 squad were incomplete on this occasion they had already done enough to finish 2nd overall. Joe McKenna was second, Sam Hutchinson sixth and Paul Martin 23rd. The Under 13 group have been very solid throughout the season and here they were led home by Jack Helm(8) followed by Matthew Lloyd, Josh Morris(25) and Michael McCarten(28). Third on the day and expecting third overall they were promoted to second place as others faltered. Coach John Bradshaw was attending the English Schools Championships and missed the Burnley finale but he will be very satisfied with the production line of talent he has created at the Edge Hill College track. LPS Men’s Captain Sammy Rashid placed an excellent second in the Sheffield 10k. In a field of over 800 finishers Sammy who lives in Sheffield carried the club colours with distinction in this high profile event. Sammy who is training for his debut marathon at London next month was pleased with time of 33:26 just 11 seconds behind winner Mike Burrett of Leeds City AC. Adam Dyson of Hallamshire was third. Sammy will be running a long leg at Bradford on the 3rd April in the Northern 12 stage and then will start his wind down for London on the 18th April. As if to contradict my comments of last week after his second place in the Sheffield 10k Sammy Rashid went one better in the Doncaster Half marathon winning in 72.38 which would indicate that we could see a fast time from Sammy at London next month. Coming home over half a minute ahead of local athlete Carl Ryde , with Rotherham’s Philip Hoole taking third in the race and second in the South Yorkshire Championship behind Carle this was a popular and well contested event. I will end here in case Sammy elects to continue to race in his preparation for London.